Somewhere in this house, I've got a copy of 'The Curry Secret' which I bought several years ago when I had an inclination to cook a chicken bhuna totally from scratch. I didn't because the first instruction was to make about 3 gallons of authentic curry sauce by slicing about 20 kilos of onions. It seemed a little excessive on the off chance that the husband wouldn't like it. Amongst the recipes was one for saag aloo. It's something I always order when I have a curry at our local curry house. Recently, in a moment of madness, I bought a pack of pre-made saag aloo. The husband loved it. It was just about passable, but looked more what Popeye squeezes out of his spinach cans than the gloriously green potato dish at the Akash. And having mastered Chicken Tikka, Mango Chutney and Naan Breads over the past few weeks, I figured that saag aloo should be my next recipe to try. Not being able to find The Curry Secret anywhere, I resorted to Google. Oddly, not many recipes came back and the ones that did had quite low ratings. Then, after a fair bit of reading, I discovered that a) it's one of those dishes that has been created in the UK for the British palate, rather like tikka massala and b) it's correct name is Palak Aloo with people mistakenly interpreting saag to mean spinach (it's in fact a spinach-like mustard leaf). So searching for palak aloo returned a few more hits. The best-rated one appeared on Food.com. I then read all 34 reviews and picked up on some of the advice and hoped that the people who said it was tasteless were wrong. I used baby new potatoes as I only had rooster potatoes and they were too floury. And I took the advice of one of the commenters and changed the order I cooked things in. I also added some chopped tomatoes for authenticity which the original recipe doesn't use. Despite needing a fair bit of salt to bring out the flavours (this may be just because of this stupid cold ruining my palate at the moment), it was a really lovely, fresh tasting dish and I'd make it again to eat on its own as a main dish with naan. Of course, the husband didn't like it. So he can go back to shop bought Popeye Aloo and I'll stick with the vaguely authentic stuff. First saute the garlic, ginger, onions and green chili together till the onion started to brown. 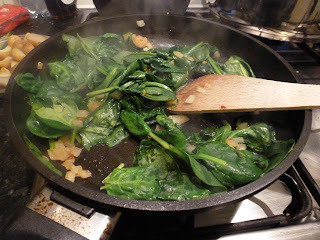 Add the spinach and cook till it wilts and puree. In a deep frying pan fry the cumin seeds for about 20 seconds till they start to lightly brown and then add the turmeric and other powdered spices and fry for about 20 seconds to bring out the flavour. 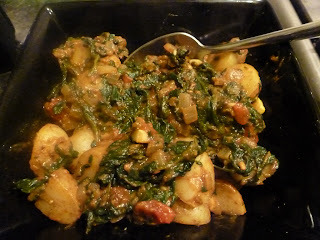 Add the spinach-onion paste, chopped tomatoes, salt, and potatoes and cook for a few minutes for the flavors to absorb and the potatoes to fully cook.